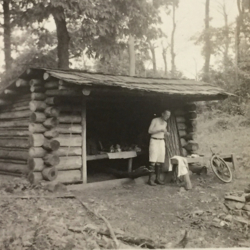 The Spring Mountain Shelter in Tennessee was one of the early Appalachian Trail Shelters in this region and survives in its original form. 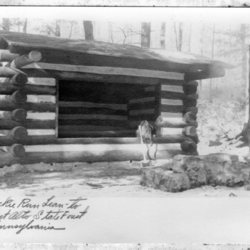 Built from logs cut and peeled nearby, the Spring Mountain Shelter is a typical example of the Adirondack style lean-to favored by the trail maintaining clubs in the Trail's infancy. 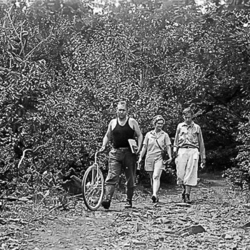 In this photo, by Myron Avery, you can see his famous measuring wheel that went with him everywhere he went on the Trail. The shelter is currently maintained by the Carolina Mountain Club. 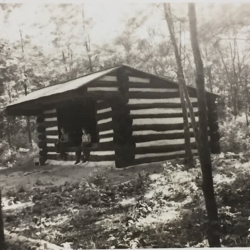 The Mosby Shelter was located on the Appalachian Trail between Manassas Gap and Chester Gap in Northern Virginia. It was built in 1939 by the Civilian Conservation Corps, operating from their camp in Linden, Virginia, just north of the site of the shelter. Today, the location of the former shelter is called the "Mosby Campsite" and the nearby Tom Sealock Spring, which is one of the sources of the Rappahannock River. Mosby Lean-to is situated on the edge of a clearing on the crest of the long spur extending to the east from High Knob, about half way between Manassas and Chester Gaps. A small settlement that formerly was in this locality is said to have been called "Mosby" because several of Colonel Mosby's rangers resided nearby. In 1980, the Mosby Shelter was stolen. Hikers arrived at the site to find that the shelter had been dismantled and removed, likely for the chestnut logs that had been used in its construction. It was not rebuilt. The Mackie Run Shelter in the Mont Alto State Forest (now Michaux State Forest) in Pennsylvania, was built in 1936, with the assistance of the Civilian Conservation Corps (CCC). Unlike other lean-to style shelters built in the area at this time, the Mackie Run shelter was built as a single structure rather than as a pair of smaller shelters. The Mackie Run shelter no longer exists. It was one of many shelters removed or relocated because it was too close to a road and thus too easily accessible to non-hikers. The Deer Lick Run Shelters, approximately one mile north, replaced the Mackie Run Shelter in this stretch of the Trail. 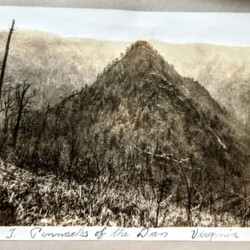 Albert Gordon "Dutch" Roth, Carlos Campbell, Guy Frizzell, Myron Avery (with measuring wheel), and Oliver Crowder on hike from Newfound Gap to Deals Gap. 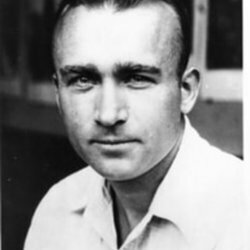 May 29-31, 1931. 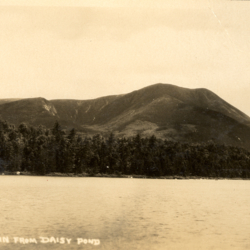 Mount Katahdin as seen from Daisy Pond (now Daicey Pond), photographed by Myron Avery. 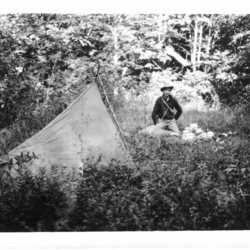 This image is from the Myron Avery Scrapbook Collection at the Maine State Library. 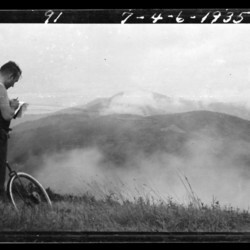 Myron Avery during a survey of the route of the Appalachian Trail in the Great Smoky Mountains National Park. 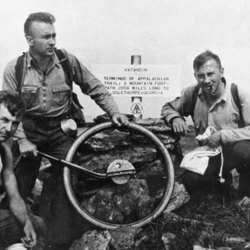 Myron Avery and two other hikers on the summit of Mount Katahdin (Maine). Myron Avery on Hawksbill Mountain in Shenandoah National Park with his famous measuring wheel. Avery was rarely without his wheel when he was on the trail. 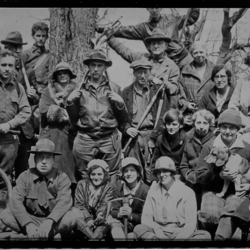 Photograph of a large group of members of the Potomac Appalachian Trail Club during a hike on the Appalachian Trail in the early 1930s. 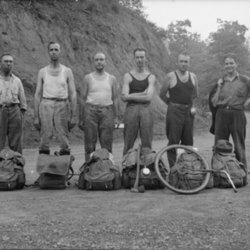 Club co-founder Myron Avery is pictured to the left with his famous measuring wheel and Frank Schairer, another co-founder and the club's first supervisor of trails is to Avery's left with clippers draped over his head.